Hypothesis: Processes of scattering and attenuation were investigated to determine the consequence on dose distributions by having a cochlear implant in the field of therapeutic radiation. Background: Radiation oncology medical accelerator beams of 6- and 18-MV x-ray energy were used. Five cochlear implants were investigated. Methods: Each implant model was individually studied using computer dose modeling and through exercises in radiation measurement during live delivery. Results: No side scatter was detected, and negligible backscattering was observed for the primary device housing and electrodes. Attenuation consequences were found to be dependent on the model of cochlear implant studied and specifically dependent on the material composition of each device. Conclusion: The maximum attenuated dose change for the study was found to be -8.8% for 6 MV and -6.6% for 18 MV. This study presents the first comparison of therapeutic radiation delivery versus computerized treatment simulation involving cochlear implants. Key Words: Cochlear-Implant- Radiation-Therapy. Since the first commercial multichannel cochlear implant was marketed by Cochlear in 1985 (1), use of the device has grown exponentially. As of mid-2010, more than 188,000 people worldwide have received a cochlear implant system (2). Recent developments in the manufacturing of cochlear implants by the market leader, Cochlear Limited (based in Australia), have resulted in an aim to provide electronically stable models (3). Studies are currently underway to determine the consequences and clinical affectability in having these devices in the field of therapeutic radiation. Included in this effort are attempts to design models capable of withstanding highenergy x-ray beams from a clinically used high-energy particle accelerator (4Y6). Currently, only 4 published articles have focused on the influence of radiation therapy on cochlear implant function in vitro (4,7Y9). In parallel to the interest, researchers are interested in determining and documenting the converse effect to the radiation beam itself, where scattering and attenuation is hypothesized but unknown. This marks the first therapeutic radiation simulation and measurement publication involving cochlear implants at clinically relevant megavoltage x-ray energies. Five Cochlear Nucleus implants are included in this study. These are the models Nucleus 22, Nucleus 24, Nucleus 24 ABI, Nucleus 24 k, and Nucleus CI512. These are illustrated in Figure 1. As one can tell, these devices come in a variety of sizes, each with a distinct construction and shape. The cochlear implant has a flexible silicone overmold that contains a magnet in the center and a receiver coil that surrounds it along the inner rim of the silicone overmold. The receiver coil connects to the receiver-stimulator, which houses complex electronics. These include capacitors, resistors, transformers, and an applicationspecific integrated circuit placed on a printed circuit board. Hermetic connections between the electronics, receiver coil, and electrode array also are located here. An example of the construction is provided in Figure 2 for the Cochlear Nucleus CI512 specifically (the latest implant marketed by Cochlear, part of the Nucleus 5 system). Many of these structures are metallic in composition. For Nucleus CI512, electrode wires and the receiver coil are made of platinum alloys. Specifically, the coil is refined platinum, whereas electrode wires are platinum-iridium. The housing (receiver/stimulator package) is made of titanium. The feedthrough is mostly aluminum. All Cochlear Nucleus implants use rare-earth magnets. Other models may have varying changes in materials of the application-specific integrated circuit on the printed circuit board or geometric changes in shape, but the basic components remain constant. These objects stated are of considerable importance for study here because they tend to scatter x-ray radiation and attenuate it, causing computed tomographic (CT) scan artifacts and can further induce dose delivery changes in radiation therapy beams, even in the megavoltage x-ray range. A phantom was used to simulate a patient having a cochlear implant. The phantom design included a water tank and waterequivalent plastic media plates. Two CIRS (Norfolk, VA, USA) model PW-3050 Plastic Water pieces, each having an area of 30 x 30 cm² x 5 cm thickness, were first positioned on the couch of the CT scanner for backscatter. A CNMC Company, Inc. (Nashville, TN, USA) model WP-3040 water tank with dimensions 40 cm wide x40 cm long x 38 cm high was then placed on top. The phantom is constructed with each side having 1-cm acrylic. The total amount of backscatter material is then 11 cm. The water tank was filled to a depth of 4 cm so that each implant could be entirely submerged. One by one, a cochlear implant was submerged and affixed to the bottom of the acrylic water tank for independent, consecutive scanning. Laser cross hairs assured that the center of all scans was at the centroid of the cochlear implant magnet, with stimulating electrodes exiting in the transverse plane as shown in Figure 1. The LightSpeed RT CT scanner (General Electric, Fairfield, CT, USA) was provided in all imaging requirements. A helical mode stereotactic radiosurgery protocol was programmed for scanning each cochlear implant. The technique included an x-ray beam of 120 kVp, nominally 221 mA in 87.3 seconds, and a couch increment of 1.25 mm per slice. A field of view at 50 cm was used. All images were autogenerated using a commissioned extended Hounsfield unit CT range. Following all scanning, a total of 1,284 slices in 5 scans were networked for computer treatment modeling. 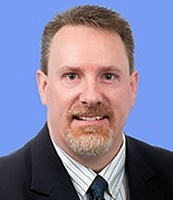 Michael Gossman, MS, DABR, RSO, is a Board Certified Qualified Expert Medical Physicist - Currently the Chief Medical Physicist & RSO of Radiation Oncology in Ashland, KY - a Medical Consultant to the U.S. Nuclear Regulatory Commission (U.S. NRC) - and an Accreditation Site Reviewer for the American College of Radiation Oncology (ACRO). He is the highest ranking scientist in the medical community. His expertise involves the safe, effective and precise delivery of radiation to achieve the therapeutic result prescribed in patient care by radiation oncologists.